July 13 marks the arrival of a sacred fast-food holiday. It's National French Fry Day. Since you're already getting a boatload of free fries, you might be curious how you'll fill your belly the rest of the day. You can't eat deep-fried potatoes for every meal (just kidding, you totally can). Dunkin' Donuts has a solution that will allow you to mix it up while allowing you to claim you ate nothing but fries all day. 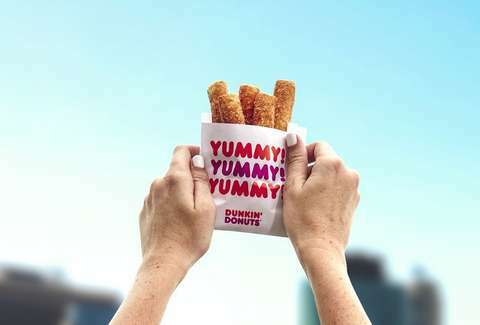 Earlier this month, Dunkin' launched Donut Fries nationwide. If the serendipitous collision of donuts and the shape of french fries made you hesitant, you can try them for free on National French Fry Day. The first 100 people through the door at 25 participating Dunkin' Donuts locations will get a free order of Donut Fries. The promotion will run from 10am to 2pm local time. You can buy Donut Fries all over the country, but the 25 participating stores are limited to five markets. It'll take place at five restaurants in Boston, five in Chicago, five in Los Angeles, five in New York City, and one store each in five cities across Tennessee. Donut Fries are a "buttery croissant style donut" coated in brown sugar. That means it's definitely not healthier than french fries, but it's technically different than french fries. That's maybe all you're looking for in breakfast dessert on a Friday.